I was recently contacted by person seeking a couple of Tom Hanks cards who is confident he'll be able to get them signed. I told him shut up, just shut up, you had me at signed... you had me at signed. Not really, but yes, I jumped at the chance at designing a card that could possibly be signed by Tom Hanks. Does it get any bigger than that? 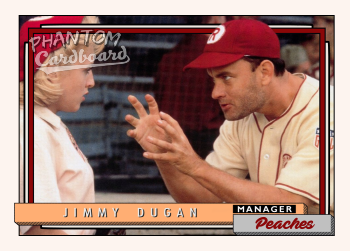 The characters in question are Jimmy Dugan from A League of Their Own and Forrest Gump. I thought about it and the two roles should be first balloters for someone who likes making custom trading cards of sports movie roles. I guess I haven't to this point because of the era they are set in. I'm an '80s kid and that's what generally stokes my nostalgic nerd fire. But, I was more than eager to take on this challenge. 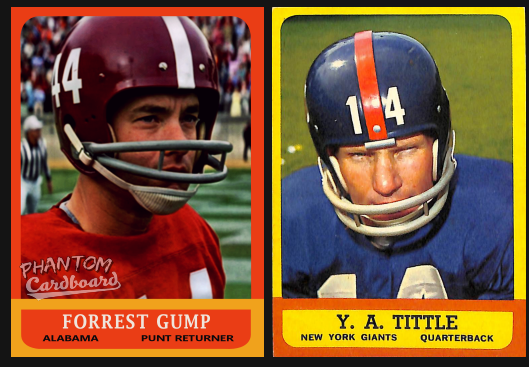 The first of the two that I made was the Forrest Gump card. For this I chose the 1963 Topps football design. Now, to the best of my knowledge the movie doesn't say a specific year that Greenbow's favorite son attended the University of Alabama in Tuscaloosa. But, we did see him witness the Stand in the Schoolhouse Door which occurred in June of 1963, and that was enough for me. The design itself is aesthetically about as simple as it gets. My challenge was trying to degrade the photo. This was something new to me as usually I'm trying to improve the quality of a crappy screen capture. I messed with the photo a ton, plus watched and read a few tutorials. I'm not sure how 1963 the end result is, but it was my best shot without actually knowing any photo aging techniques or having an app to do it for me. Up next was the Jimmy Dugan character. A league of Their Own was set in 1943, the inaugural season for the All-American Girls Professional Baseball League. I really wasn't enthused about trying to replicate another pre-1980s design ... so, I didn't. 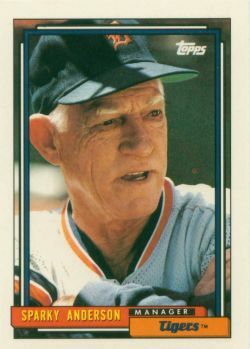 I chose to go with the 1992 Topps baseball design -- the year the movie was released. I've made some early '90s basketball card designs, but this was the first Topps baseball design beyond 1990 that I've tried. Let me just say I love the way this one turned out. The design more than anything was time consuming. It took me a while to figure out how to make the little shaded three dimensional name plates, but I eventually did. The picture is from a classic scene where the Rockford Peaches skipper is trying to find a better way to reprimand Evelyn so as not to make her cry. Because, as you're probably aware, "there's no crying in baseball". Because of the photo selection I had to go with a horizontal layout where as not all, but the majority of the 1992 Topps are vertical. Try as I might I just could not find a close fit for the boxy script team name font. So, I went with one I felt looked best. I had to place every letter individually to have the script connect, but dare I say it looks better than Topps' font choice? Now I'm just waiting on the autograph connection to get back with me. Hopefully it comes through and it's not just my mom tricking me into some Tom Hanks custom cards, because holy crap does she love her some T. Hanks - shout out to Big. The Forrest Gump is straight-up fantastic; The LEAGUE OF THEIR OWN Jimmy Dugan, though - I wish you had considered going really old school with that one. The character was based on Jimmie Foxx and Hack Wilson, supposedly. Imagine taking a Tom Hanks still and feeding it through a painting algorithm site like https://deepart.io/ and replicating an early Topps or even a cigarette card. Could be nifty!